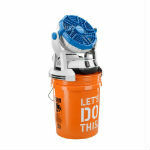 In addition to our best selling personal bottle misters and outdoor misting fans, we offer a wide selection of other cool products. Products such as E-Z Up canopy shade tents, Mac Sports portable folding utility wagons and Leading Edge original dancing LED water speakers. All of our products are made to keep you cool and keep you "cool"! EZ Up and Quik Shade are the leading portable pop up shade canopy manufacturers. These instant shade structures are the hottest selling canopy tents on the market. EZ Up Envoy 10 x 10 and Swift slant leg canopy shades are perfect as beach canopies, portable backyard BBQ shade structures and tailgate shade tents. You can also use instant pop up shade canopies for commercial street fairs, farmers markets and anywhere you need portable shade. Mac Sports folding utility wagons are made of heavy duty steel frame construction perfect for all of your hauling needs. Portable folding wagons are ideal for use as camping wagons, beach wagons, athletic and sporting event wagons. The Mac Sports folding beach wagon is the best wagon for the beach, sand, snow and uneven terrains. With oversized molded wheels and a 150lb weight capacity you can easily take all your beach gear, move gardening and landscaping supplies and carry in your heavy groceries from Costco. Mac Sports folding wagons are the number one rated folding wagon in the industry. With more 5-star rated reviews than other competitiors, they offer greater versatility compared to Ozark Trail folding wagons. The original dancing LED water speakers from Leading Edge are fun and unique. Connect the speakers to your smart phone, tablet, android phone, iPhone, computer or Xbox game console and watch the lighted water dance to the music. With the best customer reviews, Leading Edge dancing water speakers are the original patented LED water speakers. 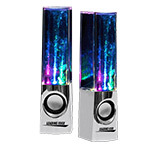 They are the most trusted multi-colored dancing LED speakers on the market. 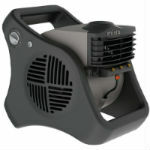 Our original watershow speakers provide big sound and are completely portable, perfect to make you the hit of the party.